How to draw Mr Incredible from the new 2018 Incredibles 2 Disney Pixar Movie for art beginners. This beginners art tutorial takes you from a blank piece of paper with a 2b pencil, cheap felt tip pens and 27 year old crayons to a finished colour drawing of Mr Incredible – Bob Parr (voiced by actor Craig T Nelson) in real time! This entry was posted in How to Draw and tagged Billy Art, billy the artist, draw a cartoon, Drawing, drawing anything, drawing basics, Drawing Mr Incredible, How to Draw, How to Draw Mr Incredible, incredibles 2, the incredibles on 18/04/2018 by billy. How to draw a quick sketch portrait of Professor Albus Dumbledore for art beginners. Using Jude Law who plays the young Dumbledore in the 2018 Fantastic Beasts and Where to Find Them film ‘The Crimes of Grindlewald’. You can see how using the simple shapes techniques you can draw a portrait of anyone. This beginners art tutorial takes you from a blank piece of paper with a 2b and 4b pencil to a full portrait drawing in real time in just over an hour. This entry was posted in How to Draw and tagged Albus Dumbledore, Billy, billy the artist, Drawing, drawing a portrait, drawing anything, drawing basics, Fantastic Beasts and Where to Find Them, Harry Potter, How to Draw, How to Draw Dumbledore, Jude Law, Professor Albus Dumbledore on 18/04/2018 by billy. 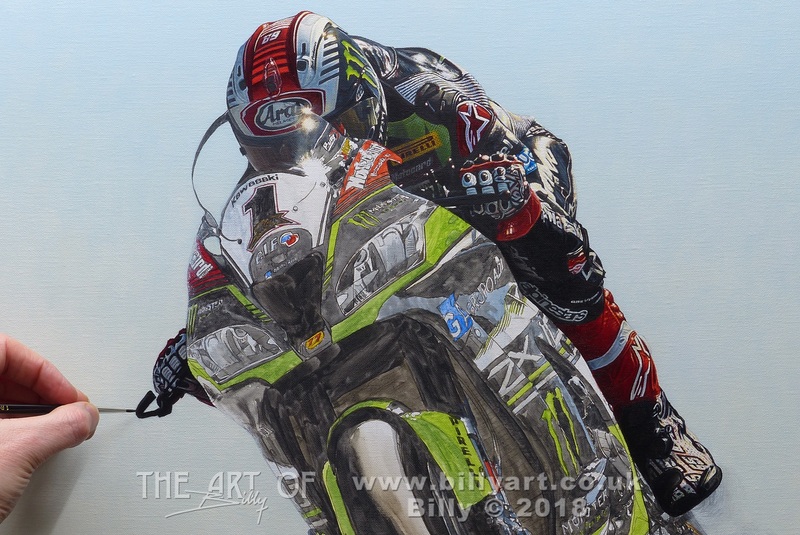 This entry was posted in Motorcycles, The Art of Billy Blog and tagged Billy, Billy Art, billy the artist, Jonathan Rea, kawasaki, Motorcycle Art, Oil Painting, Rosemary and Company Brushes, Winsor and Newton, WSB, WSBK, ZX10r on 05/03/2018 by billy. This entry was posted in Music Lessons and tagged ABRSM, Grade 1 Music Theory Past Paper, Music, music education, Music Lesson, Music Theory Lesson, music tuition, Sharon Bill on 16/02/2018 by billy. In this music theory lesson Sharon Bill works through the first section of ABRSM Grade 1 Past Paper A, 2016. She explains how to thoroughly read and answer each question, showing you how to achieve top marks in your ABRSM Music Theory Exam. This tuition helped me gain 100% in my grade 1 ABRSM music theory exam. This entry was posted in Music Lessons and tagged ABRSM, Grde 1 Music Theory Past Paper, Music, music education, Music Lesson, Music Theory Lesson, music tuition, Sharon Bill on 16/02/2018 by billy. How to draw Dug, Hognob, Goona and Lord Nooth from Early Man in real time fully narrated. Links to the full videos below and over 90 videos in my How to Draw Playlist. These beginners art tutorials take you from a blank piece of paper with a 2b pencil to a finished drawing of Dug (voiced by Eddie Redmayne – Newt Scamander in the Fantastic Beasts Movies by J K Rowling), Hognob, Goona (Maisie Williams) and Lord Nooth (Tom Hiddleston) in real time! This entry was posted in How to Draw, The Art of Billy Blog and tagged Aardman Animation, art lesson, art lessons, beginning drawing, Billy Art, billy the artist, Draw a pig, Draw Dug from Early Man, Draw Goona, Drawing, Drawing Lord Nooth, Eddie Redmayne, Fantastic Beasts and Where to Find Them, homeschool, homeschool art, homeschool mom, homeschooling, How to Draw, How to Draw Dug from Early Man, How to Draw Hognob, J K Rowling, Maisie Williams, Newt Scamander, Nick Park, Tom Hiddleston on 16/02/2018 by billy. How to draw Hognob from Early Man in real time fully narrated. Early Man is the new claymation film from Nick Park and Aardman Animation Studios who created Wallace and Gromit and Shaun the Sheep among many other amazing projects. This beginners art tutorial takes you from a blank piece of paper with a 2b pencil to a finished drawing of Hobnob the ginger Wild Boar who is the silent partner (not pet really – just as Gromit was to Wallace) of Dug (voiced by Eddie Redmayne – Newt Scamander in Fantastic Beasts and Where to Find them by J K Rowling) in real time! This entry was posted in How to Draw, The Art of Billy Blog and tagged Aardman Animation, art lesson, Billy Art, billy the artist, Claymation, Draw a pig, Draw Dug from Early Man, Early Man, Eddie Redmayne, Fantastic Beasts and Where to Find Them, homeschool, homeschool art, homeschool mom, homeschooling, How to Draw, How to Draw Hognob, J K Rowling, Newt Scamander, Nick Park on 16/02/2018 by billy. How to draw Dug from Early Man in real time fully narrated. This beginners art tutorial takes you from a blank piece of paper with a 2b pencil to a finished drawing of Dug (voiced by Eddie Redmayne – Newt Scamander in the Fantastic Beasts Movies by J K Rowling) in real time! This entry was posted in How to Draw, The Art of Billy Blog and tagged Aardman Animation, beginning drawing, Billy Art, billy the artist, Draw Dug from Early Man, Drawing, Eddie Redmayne, Fantastic Beasts and Where to Find Them, homeschool, homeschool art, homeschool mom, homeschooling, How to Draw, J K Rowling, Newt Scamander, Nick Park on 16/02/2018 by billy. A Quick Sketchbook Drawing Bill Bailey the comedian on his Larks in Transit UK tour February 2018 time-lapse. This drawing is a quick warm up exercise sketchbook doodle. The actual drawing took about 25 minutes in real time and a full narrated video will be online soon of that fully narrated art video. Bill Bailey has appeared in TV comedy programme Black Books, Spaced and on Never Mind the Buzzcocks , Have I Got News for You and QI among many others. He has been a regular at the Edinburgh Fringe and played at Glastonbury. Bill also does wildlife documentaries and a very keen bird watcher and conservationist. This entry was posted in How to Draw, The Art of Billy Blog and tagged Art, Bill Bailey, Billy Art, billy the artist, Comedian, Drawing, Larks In Transit, time-lapse, Timelapse on 08/02/2018 by billy. In this music theory lesson Sharon works through the first section of ABRSM Grade 2 Past Paper A, 2016. Part two tomorrow and three the day after. Sharon explains how to thoroughly read and answer each question, showing you how to achieve top marks in your ABRSM Music Theory Exam. This is past paper is part of a full playlist taking you right through the Grade 2 ABRSM Music Theory workbook. This teaching helped me gain 100% in my grade two exam. Here is the full ABRSM Music Theory Grade 2 full playlist link. This entry was posted in Music Lessons, The Art of Billy Blog and tagged ABRSM, homeschool, homeschool mom, homeschooling, music education, Music Lesson, Music Theory Lesson, music tuition, Sharon Bill on 07/02/2018 by billy.